Absinthe’s renaissance is quickly growing into a culinary movement. The “Green Fairy” is now showing up on cocktail menus at chic restaurants around the country. 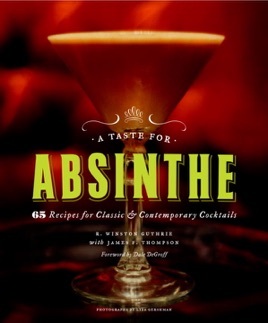 A Taste for Absinthe celebrates this storied and complex liquor by bringing you 65 cocktail recipes from America’s hottest mixologists to enjoy as you discover the spirit that has fascinated artists, musicians, and writers for centuries. Whether you want to learn everything you need to know to host “L’Heure Verte” (the Green Hour) and impress your friends with your beautiful accoutrements and practiced pouring technique, or just make a really delicious drink, A Taste for Absinthe will bring you up to speed on the most talked about liquor in history.